The Epiphone AJ-220S is a full-sized entry-level acoustic guitar that comes with an affordable price tag. 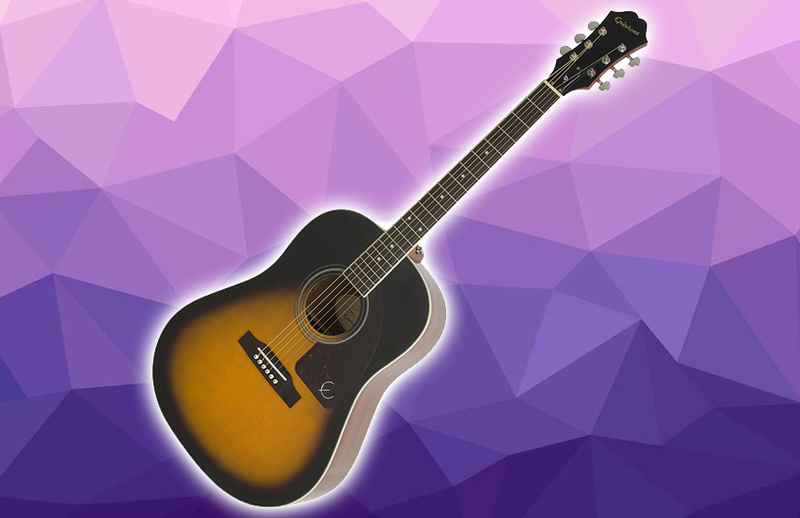 From the maker known for its top-notch acoustic products, the Epiphone AJ-220S does not fall far from the tree. One thing is for sure, there is a lot to love about this acoustic guitar. 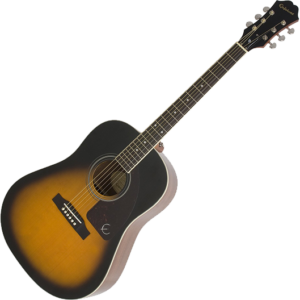 Since the Epiphone AJ-220S acoustic guitar has a jumbo body design, its big sound chamber contributes well to the rounded, deep tone that you would want for just about any playing sessions. The guitar may buzz at any given time, but despite that, its sound remains solid and impressive. You can expect a full range of tone and projection, whether you are performing live or recording. It is impressive in a way that it gives you the lowest bass notes and the highest overtones. If you are using the Epiphone AJ-220S in an acoustic ensemble, it will not overshadow the other instruments. Looking at this full-sized acoustic guitar in real life will make you think it is built with premium materials. It will not be a surprise, though, as the Epiphone AJ-220S is made with advanced design and construction in mind. The Sitka spruce top is something you would take delight in the Epiphone AJ-220S. Nothing beats a solid top wood when talking about durability in acoustic guitars. The Sitka spruce top makes the sound even more vibrant with impressive projection. And on top of that, it makes the guitar’s note more defined, which results in clear sound. Even if years will pass by, guitars with a solid wood top will always have a balanced sound. Let’s talk about looks. Not only does the Epiphone AJ-220S deliver a great sound and build, but it also has a vintage sunburst finish that makes it even more good-looking. The mahogany neck is stable, and the dovetail neck joint looks pretty durable. With its solid build, impressive sound quality, and good looks, you may think that the Epiphone AJ-220S comes with a hefty price tag. That is where you get it wrong. This jumbo acoustic guitar costs around $350 only, perfect for both beginner and advanced acoustic guitarists. The Verdict: Should I Buy Epiphone AJ-220S? So, should you buy the Epiphone AJ-220S acoustic guitar? No doubt about that. From the classic sunburst look down to the rounded, deep sound, there is a lot to love about the Epiphone AJ-220S. The Sitka spruce top alone should be enough to convince you that the Epiphone AJ-220S is worthy of your investment. Whether you are in the initial learning phase or a pro player, the Epiphone AJ-220S gives you more than what you will pay for. While it is not as cheap as its pals in the entry-level department, the Epiphone AJ-220S is a great choice more than any other else, especially because it costs less than $300. Great looks, great sound, great build. What more can you ask for?